The Steam version lacks the soundtrack, but this can be fixed. Func_Msgboard - The mapper hub, new map releases, technique improvements. FAQ on Steam forums - A starting point for new Quake II players. CD check removed by official patches. Soundtrack is still embedded in the CD. Quake II: Quad Damage. Not available for purchase in Germany. Does not come with the game soundtrack; see No music playback. A faithful higher quality icon can be found on Archive.org. The native Linux version has been ported by both iD Software and Macmillan Digital Publishing. The Ryan C. Gordon "Icculus" version can be downloaded from this page, which includes both binary and the source code to compile the software with specific settings. 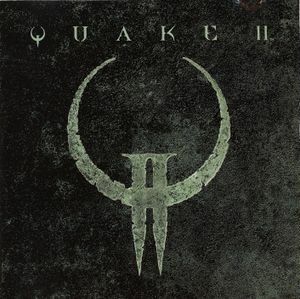 Quake II: Quad Damage includes the base game along with all expansions, a soundtrack, and a launcher created by GOG.com. This game can also be played on OS X and DOS using a source port. GOG.com's launcher for Quake II is fully customizeable by editing Q2Launcher.ini allowing you to add more mods or even modify the exe files the launcher should use. Not available for the Steam version. 3.20 - Latest official patch. Since the release of the source code various engine overhauls and source ports have been created to enhance or modify the game in different ways. Which one to use is a matter of taste. Yamagi Quake II is recommendated for authenticity to the original; Q2PRO or Quake II Starter is recommended for a multiplayer-oriented experience. Fruitz of Dojo Quake II A Cocoa port of the engine, it allows Quake II to be played on modern Macs. KMQuake II Enhanced client, allows for customization of textures, game interface etc. QuakeIIxp Enhanced port with improved graphics using an updated rendering engine. LWJake2 A LWJGL based source port focusing on compatibility and bug fixes. Q2DOS A port that features DLL loading through DJGPP, Online play with a packet driver, Intel HD audio support, HTTP downloading with libCURL, Yamagi Quake II's game dll code enhancements and all of the v3.24 unofficial patch. Q2PRO Multiplayer focused source port, available with r1ch.net anticheat module. It is also used for speedrunning. Q2VKPT Tech demo source port focused on adding full path tracing using Nvidia RTX ray tracing in Vulkan. Quake II Starter Free and standalone installer that uses the Quake II demo and patch, along with Q2PRO, to create a fully functional and multiplayer enabled version of the game. R1Q2 Multiplayer focused source port, available with r1ch.net anticheat module. Ultimate Quake II Patch Designed for the Steam version but is also compatible with retail versions. It includes KMQuake 2 (Albeit outdated) along with the soundtrack. 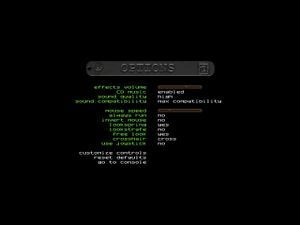 Unofficial v3.24 Patch This is a simple patch that fixes bugs and adds certain things to the engine such as widescreen-support. Easy to install and use. Yamagi Quake II Enhanced client focusing mainly on bug-fixes, compatibility with modern systems and code improvements. vkQuake2 Enhanced client using the Vulkan renderer. Some multiplayer servers require clients to use the r1ch.net anticheat module, supported source ports are listed on its website. Frame rate is capped at 83 FPS. Open autoexec.cfg or create one if it doesn't exist. Add gl_customwidth "X" where X is the horizontal resolution. Add gl_customheight "Y" where Y is the vertical resolution. Add gl_mode "-1" to enable custom resolutions. Add fov X where X is the desired FOV. Values above 90° may hide the gun model; see Issues fixed. If using Yamagi Quake II, the weapon's FOV can be set separately through r_gunfov; it defaults to 80. A value of 75 should look identical to 90° in Vanilla Quake 2. Type fov X where X is the desired field of view. Use a source port to avoid physics issues at high frame rates. Add cl_maxfps X where X is the desired FPS cap. Add r_maxfps X instead if you're using KMQuake II. Add vid_maxfps X instead if you're using Yamagi Quake II. Type cl_maxfps X where X is the desired FPS cap. Type r_maxfps X instead if you're using KMQuake II. Type vid_maxfps X instead if you're using Yamagi Quake II. Use gl_texturemode gl_nearest_mipmap_linear to disable texture smoothing while avoiding distant texture aliasing. Can be combined with anisotropic filtering. The 8-bit textures option, when disabled, uses 16-bit textures. This is independent of the texture filtering options. The game uses non-power of two textures for models, which were supported by the software renderer, but not by the OpenGL renderer. Therefore, textures in OpenGL have to be resized to a power of two; this is controlled through the console command gl_round_down. By default this is set to 1, which downsamples textures to the nearest power of two, reducing quality noticeably in the process. This was used due to limitations of contemporary 3D hardware. Setting gl_round_down 0 (and doing a vid_restart, or putting it into an autoexec.cfg) improves texture quality noticeably. Use Yamagi Quake II for SDL joystick support including haptic feedback. The VR mod offers full XInput support. See VR support. Use the Quake2VR mod (Oculus Touch only). A source port is required (e.g. KMQuake II). See Source ports. Add the line m_noaccel 1. Use the MarkC Windows 10 + 8.1 + 8 + 7 Mouse Acceleration Fix. Only for sound effects, not for CD music. A3D, EAX (via IAS patch). Use a source port such as Yamagi Quake II or Q2Pro for OpenAL Soft HRTF. 4 See the Steam Community guide. Use the Quake2VR mod with the Revive Compatibility Layer. If you are getting "function pointers have moved" error in console after trying to load game, install fan-patch 3.24. Issue noted in GOG.com release. The music plays directly from the game-CD so the Steam version unfortunately lacks it. Try applying the Ultimate Quake II patch mentioned above. If you prefer to use the original engine you can download the soundtrack from the Steam discussions. Either burn a new CD from the image file or use a CD emulator like WinCDEmu to mount the image. GOG.com version does not require this method, as the whole soundtrack is in OGG format, which the game was modified to use it instead. Might occur when using fractional display refresh rates. Create a quake2.bat file with the following content. Make sure you have the support files for the expansions ready. Available here. Open quake2.exe with a hex editor such as HxD. This problem occurs only if you try to run the main EXE file. It must be ran from the Launch Quake 2 shortcut to make it work. This is due to the fact that it contains a code in the Launch options. 1.1, 1.4, 3.2 3DFX and PowerVR MiniGL included. Yamagi Quake II updates the 1.1 renderer to 1.4 and adds a 3.2 renderer. Broken by default on Win7 x64 (Rainbow color problems in older games). Yamagi's' software renderer can render the whole game without artifacts. 1.0 A source port is required. See Source ports. DirectSound, OSS, ALSA1 OSS is used in official native Linux version. 1 ALSA support can be added by compiling the source code from Icculus version. The ingame method uses a simple linear filter; an alternative exists in the form of the mod "Quake II Facelift", released in 2007, which supports Lanczos upsampling for even further improved texture quality. It also includes several other changes, like an implementation of the water screen distortion effect from the software renderer, an option to toggle texture filtering off (via setting the "8-bit texture" option to "on"), and desktop resolution support (via selecting sub-640x480 resolutions). This mod also has a few shortcomings; widescreen support is essentially broken as objects at the left and right side of the screen are culled out, so keeping to 4:3 resolutions is recommended. Also, load times between levels are increased, text and HUD elements are forcibly upscaled and look rather ugly, and the brightness setting now affects the skybox. ↑ Yamagi Quake II moves this to %USERPROFILE%\Documents\YamagiQ2\baseq2\*.cfg unless launched with -portable. ↑ 3.0 3.1 File/folder structure within this directory reflects the path(s) listed for Windows and/or Steam game data (use Wine regedit to access Windows registry paths). Games with Steam Cloud support may store data in ~/.steam/steam/userdata/<user-id>/2320/ in addition to or instead of this directory. The app ID (2320) may differ in some cases. Treat backslashes as forward slashes. See the glossary page for details. This page was last edited on 2 March 2019, at 02:01.